I would like to introduce you to my friend Maggie ~ although you may remember her house tour from my other blog. Maggie and her husband Kyle adopted a sweet little girl (Luci) several years ago, and she has been such a blessing to their family. Now Maggie wants to "pay it forward" and help other families in funding their own adoptions. Isn't that fabulous?! She is so stylish and creative, and has such sweet items to offer on her site (for the little girls in your life). I would just encourage you to check out her blog, and help her raise some support for Kami McKibben (a precious little girl from Ethiopia, waiting to join her new family). Fifty percent of the profits will benefit Kami, and the other fifty will cover material expenses. Please pay a visit to Sweet M's for all the details, and let's bring Kami home!!! One of my personal favorites: Let them eat cake! 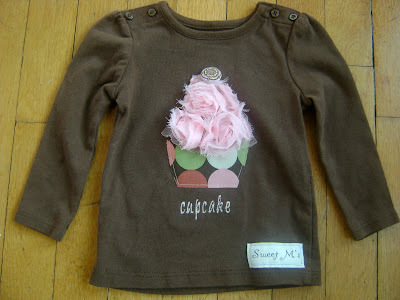 PS Don't you just LOVE the cupcake and rosette combo?! Two of my favorite things on one sweet shirt. Maggie, you rock! I wish we lived in the same state so I could learn your techniques and work with you in that amazing craft room!